Just peeking in for a quick hello. You are a such a lovely distraction with my late-morning cup of tea, but I'm determined to stay focused today. I'm hoping to put a few new items in my shop on Monday morning, so for a couple of hours my sewing machine and new Pandora station (Ray Lamontagne) are my companions, as I dive into making. 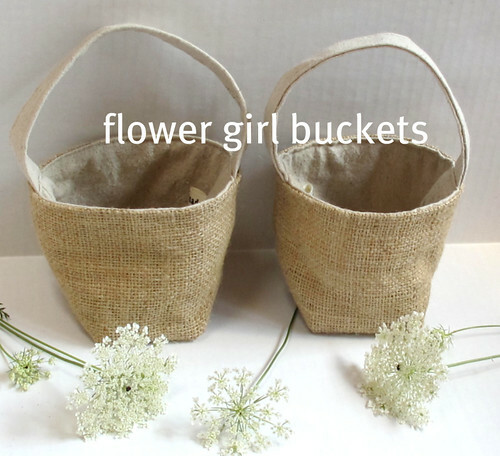 The custom flower girl buckets above are an example of some of the only burlap sewing I did this summer. I'm making a couple of similar ones for next week for forest foraging. It's fun to to get reacquainted with burlap, the perfect fall fabric. 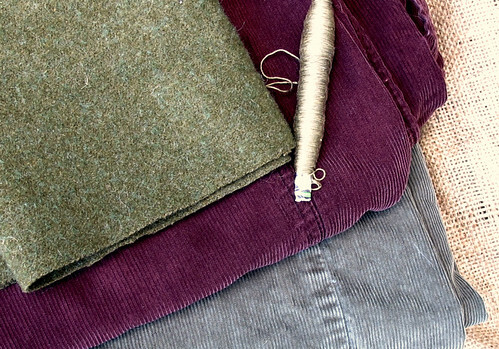 I'm adding sturdy linen, wool, and corduroy to this season's material list. There's a stack of deconstructed clothing and wool blankets in gorgeous hues of autumn that are desperately wanting to be repurposed into new and useful designs. I'll share more glimpses later this week. Is the shift in seasons inspiring you with new palettes and textures, too? Oh Maya, my friend, you are always up with something great ! Can't wait to see your next shop update ! 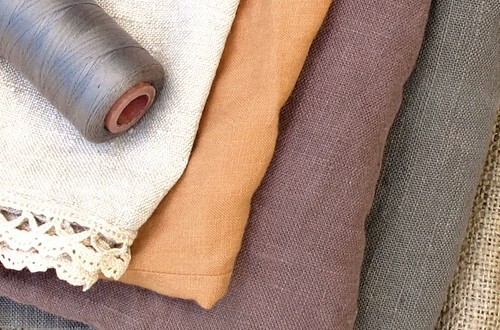 these linens & corduroys are soooo yummy looking ! I love those colors and textures! I am so very ready for fall and ready to dive into a pile of rich corduroy. Thanks for the sneak peek! Now I am rubbing my hands in anticipation :). I love autumnal earthiness. Gotta love pandora! Such cute baskets, anxious for fall too. Glad you found time to sew :)) Looks all yummi! a few more colder nights and I am definitely heading to my fabric stash to see if I can sew up a few warm things. Can I be a flower girl just for one of those baskets? ;) I spread flowers nicely! heheh! Those corduroy colors are dreaaaaaamy! ı love your bascets everytime,thanks this beauty..
Oof, cannot wait to see what becomes of all this linen and courderoy loveliness! Those linens are so gorgeous! So Autumnal! Used to listen to Pandora until a friend told me about Groove Shark. Oh, and I LOVE Ray Lamontagne. His album 'Till The Sun Turns Black' is practically perfection. Unfortunately I'm being inspired by all the autumnal colours when in fact we are headed for spring! I need to start looking a bit closer to home to get ready for our warmer (read: stinking hot) weather! My vote is for another blouse.